Applications to InovaLIG, the first innovation development program of Turkey, which has been created by Turkish Exporters Assembly (TIM) 5 years ago, has been continuing at full speed. Applications from each and every sector are accepted at www.inovalig.com until June 30th, 2018. With 971 companies applying to 2017 İnovaLİG, Turkey was able to become one of the countries with the highest participation in the IMP3rove program and the champions received the awards at Turkey Innovation and Entrepreneur Week from Mr. President of Turkey. As a result of the first phase, a 100-page comprehensive innovation assessment and benchmark analysis report is being prepared for each participating company. 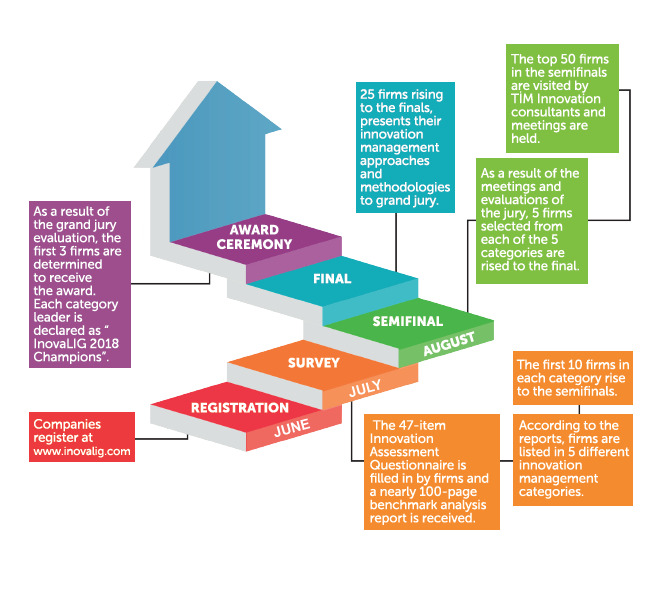 This report, worth 350 €, is sent free of charge to all participating companies..
A total of 25 companies from 5 different categories are eligible to participate in the semifinals based on IMP3rove Academy benchmark reports. Semi-finalists are making presentations about the innovation management approaches in the 5 minutes to the grand jury. As a result of the grand jury evaluation, the first 3 firms are determined to receive the award in each category in Innovation and Entrepreneurship Week. With InovaLIG, companies are able to measure innovation competencies and to develop their innovation cultures on an interactive platform. We are delighted to focus on medium and long term goals of the participating firms and enable them to follow innovation developments over years. With the expanding of innovation management and awareness, everyone from the President to the sector representatives is contributing to InovaLIG and this situation is a source of pride for us by separating our country from other countries. This program is a touchstone of reaching the 2023 targets of our exporting companies ,and this program shapes the vision of the companies . In this sense, we invite all companies to participate in InovaLIG 2018 on www.inovalig.com until June 30th, 2018 in order to see the development of the applied companies and for new companies' situations. We, as the Turkish Exporters Assembly, believe that we will achieve further together with InovaLIG 2018 and we hope to receive much more intensive participation this year. We strongly believe that we will carry our country much more higher in the league of innovation. Deadline for registration is June 30th, 2018.